It is finally the new year! With a new year comes new kitchen trends, and countertops are at the forefront of innovation when it comes to kitchen remodels. 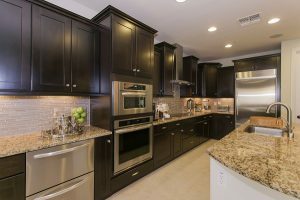 The kitchen countertop is the foundation of any kitchen; it sets the tone and mood for the entirety of the room, so you need to be sure you pick the right one. Countertop material, finish, and design are all so important to any kitchen, and today, it seems as if the possibilities are endless. Although 2019 has just begun, there are obvious forerunners in countertop trends that are sure to stand the test of time. It is finally the new year! With a new year comes new kitchen trends, and countertops are at the forefront of innovation when it comes to kitchen remodels. Though it is one of the more recent materials that has jumped onto the countertop scene, quartz continues to be a huge contender for most popular countertop material in 2019. As a high-end alternative to granite, it is strong, unique, and beautiful. Unlike granite, it is not porous, so it does not take as much time and effort to maintain as granite does. It is also naturally antimicrobial, which is another big plus. Quartz also comes in many patterns, colors, and finishes; you can even get it to look like natural stone. Currently, matte finishes are popular on quartz countertops, but the best thing about quartz is that you can get super creative with the design. More and more, homeowners are looking to introduce some character and pizzaz so their countertops. Unlike boring countertops of the past, today’s technologies allow countertops to be manufactured in an array or colors, finishes, and patterns. With readily available materials like quartz, manufacturers can actually create veins and swirly patterns in the surface to mimic the look of expensive stone or granite. This gives your space creativity and personality that it may have lacked before. You can get even more creative and mash these funky countertops with different flooring, walls, cabinetry, or backsplash. Neutral tones and colors dominate the countertop market today. Art deco and mid-century styles are beginning to lose our to more calm, laid back tones and colors. Soft greys, whites, and beiges are all the rage in 2019, as there is more of a focus on highlighting important individual components of the kitchen by using neutral backdrops. One or two interesting patterns to draw the eye are set against a flat background in order to really put these special designs at the center of your vision. If you still have more questions regarding kitchen countertop trends for 2019, Rock Tops Fabrication is here to answer them. Our trained professionals are here to make sure that your new kitchen is designed and finished in exactly the way you want it. We service Maryland, DC, and Virginia. Feel free to give us a call at 410-363-4257. For more information, tips and tricks, and to see what we have been up to, be sure to follow us on Twitter, Facebook, Youtube, Google+, Pinterest, and Houzz. This entry was posted on Friday, January 25th, 2019 at 2:52 pm. Both comments and pings are currently closed.